F J.T. Barnett (Vancouver, Kamloops, Everett, Kelowna, 2008-13) has been released by mutual agreement by Timrå (Sweden, Allsvenskan). He was pointless in two games there. Earlier this season, he was pointless in one game with CSKA Moscow (Russia, KHL), had seven goals and three assists in 24 games with CSKA farm team Zvezda Chekhov (Russia, Vysshaya Liga); and was pointless in three games with Amur Khabarovsk (Russia, KHL). . . .
G Ville Kolppanen (Lethbridge, 2009-10) has been released by Neftekhimik Nizhnekamsk (Russia, KHL). In 30 games, he was 2.18 and .917 SP. Kolppanen had one year left on his contract with Nizhnekamsk and was one of 10 Nizhnekamsk players released Tuesday. . . . The KHL regular season ended Sunday and Nizhnekamsk finished out of the playoffs. Bill Bestwick, a Nanaimo city councillor, has told a local newspaper that the Vancouver Island city will have a WHL franchise if taxpayers vote YES for a new arena in a March 11 referendum. According to Greg Sakaki of the Nanaimo News Bulletin, Bestwick told the newspaper that the arrival of a WHL franchise is a “100 per cent” certainty if the vote is yes. Bestwick is a longtime former BCHL coach who spent 12 seasons (1999-2012) as GM/head coach of the Nanaimo Clippers. These days, he is a part-time amateur scout for the NHL’s St. Louis Blues. It has been common knowledge for a while now that the Ice will end up playing out of the Frank Crane Arena in Nanaimo next season should the referendum pass. A WHL team likely would spend three seasons in the 3,000-seat facility, with a new building expected to be ready for 2019-20. Taking Note was told last month that the WHL is preparing two schedules for 2016-17 — one of those features 22 teams, including Nanaimo; the other features the same 22 cities that are in the league today. The arrival of a WHL franchise would result in the BCHL’s Nanaimo Clippers relocating. The Clippers play out of the Frank Crane Arena. The Kamloops Blazers had all of their coaches on hand Tuesday night as they skated to a 7-0 victory over the visiting Edmonton Oil Kings. The Blazers start home games with head coach Don Hay and lead assistant Mike Needham at the bench. Terry Bangen, a veteran coach, joins them to start the second period. Chris Murray, who played with the Blazers before going on to skate in the NHL, is a local firefighter who also is on the Kamloops coaching staff. When he isn’t at work, he joins the others behind the bench for the third period. When Murray isn’t available, De Palma frequently spends the third period at the bench. Which leads us to this question: Is there another team in junior hockey that sometimes has four coaches at the bench? D Luke Gallagher has been added to the Spokane Chiefs’ roster for the remainder of this season. Gallagher, 16, is from Mead, Wash., and had been playing for the junior B Spokane Braves of the Kootenay International Junior Hockey League. He had 37 points, including 13 goals, in 45 games with the Braves. . . Prior to that, he spent two seasons at the EDGE school in Calgary. . . . He was selected by the Chiefs in the eighth round of the 2015 WHL bantam draft. . . . The Chiefs now are carrying three 2000-born defencemen, with Gallagher joining Ty Smith, a first-round pick in the 2015 bantam draft, and Matt Leduc, who was selected in the second round. The WHL has suspended F Kolby Johnson of the Prince Albert Raiders for three games after he took a charging major and game misconduct for a hit on F Orrin Centazzo of the visiting Everett Silvertips on Friday night. Everett won the game, 3-1. . . . Centazzo didn’t play in a 3-2 OT victory over the Broncos in Swift Current on Saturday. He is listed as having an upper-body injury and being out month-to-month on the WHL roster report that was released Tuesday. . . . Johnson has served two games of that suspension and will miss Friday’s game against the host Saskatoon Blades. He will be eligible to return for the rematch on Saturday in Prince Albert. . . . The Raiders also were fined $500 “for inadequate security at officials’ exit” during that game against Everett. You are left to speculate which member, or members, of the Raiders organization stopped to say “Howdy” to the officials after the game. 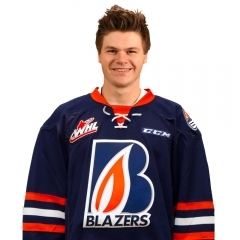 The Saskatoon Blades have returned F Tyler Lees to the midget AAA Regina Pats Canadians. Lees, 16, has one goal in seven games with the Blades this season. He played four games with the Blades last week, scoring his first WHL goal on Saturday in a 6-2 loss to the host Lethbridge Hurricanes. . . . Lees was a fifth-round selection by the Blades in the 2015 bantam draft. . . . The Blades also have brought in Payton McIsaac, 16, to serve as their seventh defenceman for now. He had been playing for the midget AAA Fort Saskatchewan Rangers, whose season has ended. From Fort Saskatchewan, he was a second-round selection in the 2015 bantam draft. back-to-back shutouts — he has been beaten once in his last three starts — and now has five blank jobs this season. The franchise single-season record is seven (Dustin Butler, 2006-07). . . . Ingram has 12 career shutouts, three off Devan Dubnyk’s franchise record. . . . Ingram’s GAA this season now is at 2.10. The franchise record (2.31) was set by Kenric Exner, who made 51 appearances in 1998-99. . . . With the Kelowna Rockets in Kamloops on Friday, Ingram is riding a shutout streak of 178:07. . . . F Lane Bauer, who was acquired from the Oil Kings, along with a seventh-round pick in the 2017 WHL bantam draft, for D Conner McDonald, burned his former team for two goals. . . . Bauer opened the scoring at 4:46, with F Deven Sideroff counting at 5:27 and F Collin Shirley getting No. 25 at 7:53. . . . The Blazers added three more goals in the second period, as D Ondrej Vala got his 10th, F Rudolfs Balcers scoed his 35th and Bauer got No. 35. . . . Sideroff, playing in his 200th game with Kamloops, got his second of the game, and 33rd of the season, at 6:39 of the third. . . . Shirley, Balcers and Sideroff had an assist apiece. . . . Edmonton started G Patrick Dea, who surrendered six goals on 26 shots over two periods. Josh Dechaine came on for the third period and stopped six of seven shots. . . . Ingram also picked up his second career assist. He got the first one on Feb. 8 in a 6-0 victory over the visiting Rockets. That was his 146th regular-season game; last night was No. 151. . . . Each team was 0-4 on the PP. . . . The Blazers (37-19-6) have won three in a row. They are second in the B.C. Division, one point behind Prince George. . . . The Oil Kings (20-35-5) have lost three straight (0-2-1). They are nine points out of a playoff spot with 12 games remaining. . . . Announced attendance: 3,474. Warriors erupted for three straight goals. . . . F John Dahlstrom (24) have the hosts a 1-0 lead at 9:08 of the first period, only to have F Thomas Foster (16) tied it, on a PP, at 11:26. . . . Howden put the visitors out front at 3:10 of the second period, with F Mason Shaw (23) getting the Tigers into a tie, on a PP, at 7:19. . . . The Warriors went out front when F Branden Klatt scored his sixth goal, at 9:17, and took a 4-2 lead on F Justin Almeida’s eighth goal, at 13:59. . . . Howden scored 12 seconds into the third period, stretching the lead to 5-2. . . . F Josh Williams scored his first WHL goal at 3:28 to get the Tigers to within two. . . . Williams, who turns 16 on March 8, was playing his fourth game. 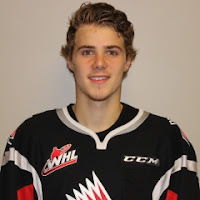 From Langley, B.C., he was the fifth overall pick in the WHL’s 2016 bantam draft. . . . Howden completed his second career hat trick with his 33rd goal of the season at 15:22. . . . Moose Jaw got two assists from each of F Tanner Jeannot, F Jayden Halbgewachs and F Yan Khomenko, with Klatt adding one to his goal. . . . F Matt Bradley had two assists for the Tigers. . . . G Zach Sawchenko stopped 19 shots for Moose Jaw, while G Michael Bullion blocked 31 at the other end. . . . Medicine Hat was 1-1 on the PP; Moose Jaw was 1-3. . . . Medicine Hat dressed only 17 skaters, one under the maximum. . . . The Tigers, who have been fighting an outbreak of mumps, got back Dahlstrom and F Zach Fischer, but had to scratch F James Hamblin. Still out are D Kristians Rubins, D Jordan Henderson and F Ryan Chyzowski. As well, D David Quenneville and D Ty Schultz continue to rehab broken legs. Quenneville, who has been practising, may return when the Tigers meet the host Calgary Hitmen on Friday. . . . The Warriors continue to play without F Noah Gregor and F Brayden Burke. . . . The Warriors (35-17-8) have won three in a row. They are second in the East Division, eight points ahead of Swift Current. The Broncos hold two games in hand. . . . The Tigers (42-18-1) lead the Central Division by six points over Lethbridge, with the Hurricanes having two games in hand. . . . Announced attendance: 3,354. 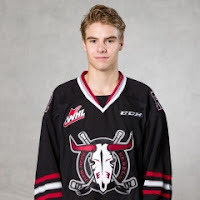 At Prince George, F Brandon Hagel scored the only goal of a shootout to give the Red Deer Rebels a 3-2 victory over the Cougars. . . . Hagel was the first skater to shoot and his goal stood up as the winner. . . . The Cougars took a 1-0 lead when F Radovan Bondra scored his 28th goal, at 7:56 of the first period. . . . Red Deer tied it on D Jared Freadrich’s sixth goal, on a PP, at 7:04 of the second period. . . . The Cougars went back out front on F Kody McDonald’s 13th goal, at 17:16. . . . Red Deer forced OT when F Lane Zablocki (21) scored at 3:26 of the third period. . . . Freadrich and Hagel added an assist each. . . . G Lasse Petersen stopped 36 shots through OT and was perfect in the shootout. . . . The Cougars got 22 saves from Ty Edmonds. . . . Red Deer was 1-6 on the PP; Prince George was 0-4. . . . D Cole Moberg, 16, played his fourth game of the season with the Cougars. He plays for the major midget Vancouver Northwest Giants. . . . F Michael Spacek (ill) was among Red Deer’s scratches. . . . The Rebels went 1-3-1 on a five-game swing that involved three stops in the U.S. Division, along with games in Langley, B.C., and Prince George. . . . Red Deer (24-27-10) had lost its previous eight games (0-6-2). It is third in the Central Division, four points up on Calgary. The Hitmen have three games in hand. . . . The Rebels and Hitmen will play Saturday in Red Deer and Sunday in Calgary. . . . Prince George has lost three in a row (0-2-1). The loser point from this one kept it atop the B.C. Division, by a single point over Kamloops. Each has played 62 games. . . . Announced attendance: 2,580.